After doing a detailed analysis of your busines, we design a customised Xero implementation plan and set up your bookkeeping system. If you’re already using a bookkeeping platform, we’ll design a migration plan instead. Set up takes about ten working days and includes two tailored online training workshop where we guide you through Xero and its capabilities. No bookkeeping experience is required. We do all the heavy lifting for you. At the beginning of every month, we categorise your income and expenses for last month, reconcile your bank accounts, get in touch about any questions. Depending on which plan you choose, we prepare a report of your business finances monthly or quarterly. Xero syncs with all major banks, which allows us to view and categorise your transactions and balance your books online. If needed, we can also handle your payroll and accounts payable functions and do your bookkeeping on a weekly or fortnightly basis. It’s normal to have questions about your books. That’s why we’re here. Whenever you have a question, simply email us and we’ll respond within two business days. For GST/VAT registered clients in Australia and United Kingdom, at the end of every financial reporting quarter, we prepare your GST/VAT summary report (known as a Business Activity Statement in Australia.) Not only do we make tax reporting easy and efficient, but you have the added confidence of knowing that your bookkeeping is tax compliant. At the end of the financial year, we take pride in making sure that you and your accountant have absolutely everything you need to complete your annual tax return smoothly and on time. As well as providing you with a comprehensive digital package, your accountant may access your Xero file and adjust it directly. Our clients get a world-class bookkeeping system coupled with caring support. Behind our ninja masks, we’re real people who genuinely care about you and your business. In fact, we love bookkeeping so much that we keep winning awards for it. Risk-free: no lock-in contracts, cancel anytime. Affordable monthly or annual payments. Not ready for a bookkeeper? Some entrepreneurs aren’t ready to outsource their bookkeeping, but still want the benefits of financial record keeping and reporting. Implementing a bookkeeping system such as Xero into your business is one of the best and most affordable investments you can make. When set up properly, the system will scale with your business and provide the information you need to make great business decisions now and into the future. We make sure that your bookkeeping gets off to a great start. 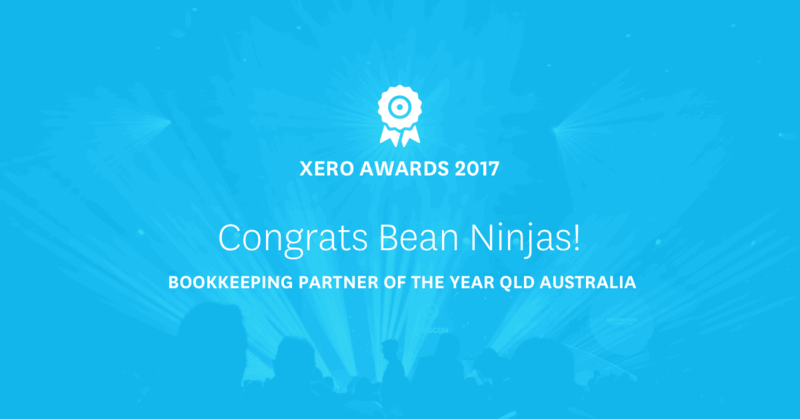 With Bean Ninjas handling your Xero setup and bookkeeping training you know you’re set for success. We’ll customise your chart of accounts, set up your bank feeds, branded invoices, coding rules and much more. Every Xero Implementation includes two hands-on, one-on-one training sessions with an expert Bean Ninja. If Xero Implementation is not required, you still have the option of online training, group training or executive mentoring to sharpen your bookkeeping and business financial skills. After analysing your business needs, we design a customised Xero implementation plan and set up your bookkeeping system. We also provide training and ongoing support that makes staying on top of your bookkeeping easier. Does the finance side of your business bamboozle you? We recognise that most entrepreneurs come from non-accounting backgrounds. That’s why we offer world class bookkeeping and business finance training in three different formats. We can help bring your books up to date, whether the backlog is weeks, months or years. Already a Xero user but not sure if your Xero file is 100% healthy? Our 100-point check will identify and fix any issues. Have you ever wished that you could access the benefits of an experienced Chief Financial Officer to look over your business, identify gaps and risks and make recommendations for improvements? Now you can. In a Virtual CFO Session, our executive team, each of them a qualified accountant, will meet with you and your key people to discuss the results of a nine-part questionnaire that delves deeply into all financial aspects of your business. Some entrepreneurs are accountants, but the vast majority come from non-business backgrounds. We recognise that and have created a suite of financial training programs designed to equip you with practical, relevant, tailored financial management skills to suit you and your business. You can learn online, in small group coaching or through executive mentoring. Our Xero Migration service is for business owners who have an existing accounting package, such as like Quickbooks, MYOB, Freshbooks or Wave, but desire the advantages of Xero. We’ll do the planning and heavy lifting to ensure that your books are migrated quickly and accurately.